Powerful Readyset features advanced 2.4GHz KT-200 R/C system with fail-safe function! The Inferno’s 1/8 GP buggy world championship winning performance is now easier than ever to drive! 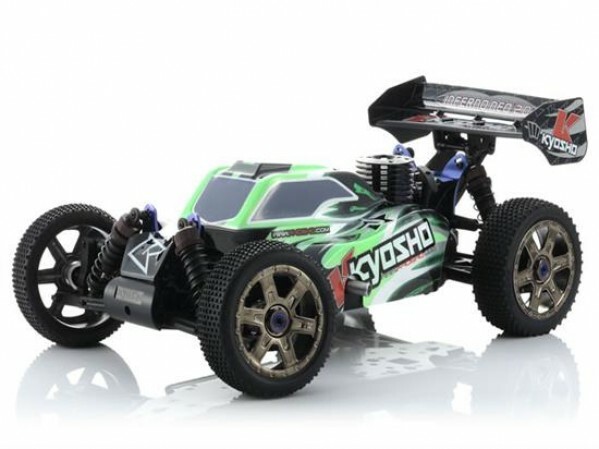 With an unrivalled record of 8 titles at the bi-annual World Championships, the dynamic performance of the Kyosho Inferno has been concentrated into a new hard charging yet easy to drive machine, suitably named the ‘Inferno NEO’. Boasting the Inferno's renowned adaptability on any surface, the NEO features 3.5mm shaft big bore shocks and the same heavy-duty wheels as the high performance MP9, with micro-square pattern tires and resin torque rods (front & rear). A newly designed body with new color scheme also adds superior aerodynamics for awesome speed and easy control. The advanced 2.4GHz Syncro KT-200 control system provides safe and reliable control as soon as it is switched on, without the need to manage frequency bands and is equipped with various additional features that provide precision adjustment of setup. It also includes a fail-safe function that automatically slows the car down in the event of radio signal problems. As the NEO is packaged as a Readyset, you can be charging along at full speed in next to no time just by adding fuel, batteries for the R/C system and engine starting equipment. As the definitive 1/8 GP sports buggy, the Inferno NEO Syncro KT-200 takes you into the thrilling world of off-road racing!